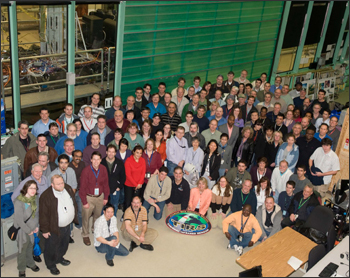 The LDCM thermal instrument engineering team at NASA Goddard Space Flight Center. Building a satellite is a major collaboration and involves the hard work of many different types of engineers. The engineering process for Landsat involves defining the satellite requirements, testing the design, building the instruments and satellite, then testing the instruments and satellite, integrating the satellite and instruments together, launching the satellite, and then operating the satellite once it reaches its orbit. 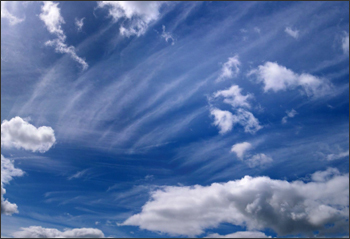 Wispy high cirrus clouds can interfere with satellite measurements. LDCM was designed to build on Landsat’s legacy. The Operational Land Imager (OLI) will see the same parts of the electromagnetic spectrum as the Landsat 7 instrument, but it will also see two additional parts of the spectrum. These new bands will help scientists measure high, thin clouds and water quality. One of the new bands will help scientists measure chlorophyll concentrations (ocean color) in coastal regions. Most of the chlorophyll comes from phytoplankton, tiny plant-like organisms that live in surface waters. The other new band will help detect thin clouds. High, thin cirrus clouds can be hard to spot in satellite images. Both the clouds and their shadows can interfere with measurements. The next Landsat satellite will be able to detect these clouds better than previous Landsat sensors because it measures light in the part of the electromagnetic spectrum where the clouds are most visible. Landsat collects images in long narrow strips called “swaths.” Each swath is 185 kilometers (115 miles) wide and is 2,752 kilometers (1,710 miles) from the next adjacent swath taken that day. It takes 16 days for the swaths to overlap enough to image the whole Earth. Previous Landsat sensors swept back and forth across the swath like a whisk broom to collect data. The sensor looked at a calibration source at the end of every row, which means that measurements were consistent from orbit to orbit. But this sensor design requires fast-moving parts, which are more likely to break. LDCM (Landsat 8) will view across the entire swath at once, building strips of data like a pushbroom. This approach requires no moving parts. The pushbroom sensor is smaller and lighter than whisk broom sensors, but is harder to calibrate. “It was a natural step to evolve to a pushbroom sensor. The technology was proven on other satellites, and we knew we could get better accuracy. The pushbroom has no moving parts. It is a newer and more reliable technology. The smaller LDCM spacecraft was not suitable for another new whiskbroom sensor, even it if was a new design. We needed a smaller sensor, and the pushbroom is smaller and lighter than a whiskbroom sensor,” explains Terry Arvidson, senior project engineer. The pushbroom design allows more light to enter the telescope, introducing the problem of stray light. Have you ever felt blinded when looking through a dirty, scratched, or wet window? The dirt or water scatters light, so you get sunlight in your eyes even if the Sun isn’t directly in front of you. This is an example of stray light. Because the Operational Land Imager has a pushbroom design, it has a wide focal plane—the place where the light enters the sensors and because the plane is wide, it is easy for light to enter from many directions. This scattered light “blinds” the sensor to what it is trying to see directly below. Scattered light, or stray light, is a problem especially when trying to image a dark-colored forest or water next to a bright cloud or snow field. 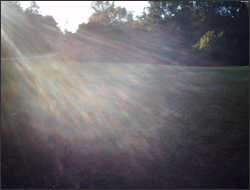 Light from the bright surfaces can “blind” the sensor to the dark features nearby. To isolate and solve the stray light problem Engineers at Ball Aerospace designed a special test facility to test the Operational Land Imager (OLI) for unwanted stray light. The room is completely dark except for a single light source. This allows engineers to see where light goes when it enters the sensor. They move the light source around the sensor. The goal is to ensure that light enters the sensor only when it is directly in front of it. Engineers minimized stray light in the OLI sensor by putting a tilted window in front of the focal plane, where light enters the sensors. Engineers also placed a black chromecoated baffle in front of the telescope to limit the light that enters the sensor. The oblong-shaped baffles are prominent features on the OLI sensor, left. The baffles have thin vanes inside to help deflect stray light. The material itself absorbs light coming from everywhere but straight down. The little light that does scatter off the black chrome surface moves very predictably. The second baffle, facing right, is for calibration. The camera that took these photos uses the same technology as the new Thermal Infrared Sensor (TIRS) on the Landsat Data Continuity Mission. Notice that the room is cooler (darker) than the people. Noses are often cooler than the rest of our face. 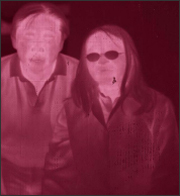 The woman’s glasses are black because thermal infrared light does not pass through glass. One of the LDCM design requirements was a sensor that measures heat from the Earth. Why? 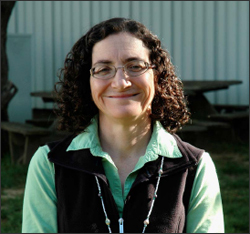 By measuring heat, Landsat sensors can gauge water usage and pinpoint water consumption on a field by field basis. Everything on Earth emits thermal infrared radiation. The amount of emitted radiation depends on the temperature. Thermal infrared sensors have flown on Landsats 4, 5, and Landsat 7. 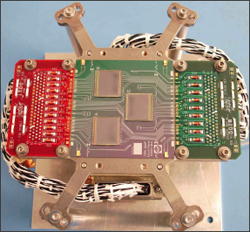 The decision to add a thermal infrared sensor to the Landsat Data Continuity Mission came late. Engineers at NASA Goddard Space Flight Center had less than four years to design and build the Thermal Infrared Sensor (TIRS). But, they did it! While we can’t see heat, we have cameras that can measure infrared energy. 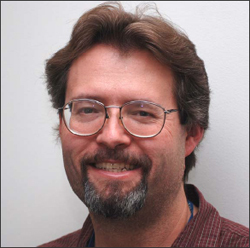 “The Quantum Well Infrared Photodetectors, or QWIPs, are light traps.” says Philip Dabney, an LDCM Instrument Scientist. A frame containing optical filters is placed over the QWIP sensors. The filters only allow certain wavelengths of thermal infrared light to enter the sensors. The entire package (called the focal plane) is mounted in the base of the telescope, the circular lenses shown above. After light from Earth enters the telescope, lenses focus and direct the light through the filters, and into the QWIP sensors. Why use QWIPs? Because engineers had less than four years to design and build TIRS. They turned to QWIPs, a new technology that had been developed at Goddard. QWIPs are made from material that is compatible with silicon processing, meaning that the same tools and facilities used build computer chips can be used to build QWIPs. They are very reliable, uniform, and well-suited to TIRS’ requirements. Engineers at NASA Goddard knew how to work with QWIPs and could build the instrument in the short time available. A frame containing optical filters is placed over the QWIP sensors. The filters only allow certain wavelengths of thermal infrared light to enter the sensors. The entire package (called the focal plane) is mounted in the base of the telescope. After light from Earth enters the telescope, lenses focus and direct the light through the filters, and into the QWIP sensors. The three squares in the center of the circuit board are QWIPs, which are gallium arsenide semiconductor chips. Each QWIP can measure 327,680 pixels. The QWIPs on TIRS detect two narrow segments of the thermal infrared spectrum. The decisions made to keep the QWIPs cool are an example of how engineers solved problems to build the LDCM satellite. Engineers put the cryocooler and new shock absorption system on a shaker table that simulates a launch. The analysis and testing showed that the absorption system would not survive the intense shaking of launch. So, engineers added a release mechanism to secure the cryocooler’s shock absorption system during launch. The new shock absorption system had to be integrated into the already built Thermal Infrared Sensor instrument without changing its mass or power requirements and it had to be completed in a matter of weeks to be included on the instrument. Engineers succeeded in solving these and other problems to complete TIRS in just three years. QWIPs need to be very cold—43 Kelvin—to function. That’s just 43 degrees above absolute zero, i.e., -382 degrees Fahrenheit or -230 Celsius. Thermal tests in a vacuum chamber showed that the QWIPs were getting too warm. The metal that they were mounted on did not transfer enough heat from the sensitive detectors, so engineers added extra glue between the QWIPs and the metal plate. The glue helps to keep the QWIPs cool by providing an additional exit path for heat. Because the QWIPs use electricity, which make them get warm, engineers realized that the QWIP would need a cooler in order to maintain the required 43 Kelvin temperature. They designed a cryogenic cryocooler where the cylinders are filled with helium to provide this extreme temperature control. Will it survive vibration during launch? Earth observing satellites are tested to make sure they can survive the extreme conditions of launch and operation in space. One kind of test involves bolting the observatory to a deck and shaking it harder than the launch will. Will it survive the pounding noise of launch? Will it survive the vacuum and extreme temperatures of space? The spacecraft is built in Earth’s atmosphere where air moves heat away from the warm instruments. How will the instruments function in a vacuum where there is no atmosphere? Without an atmosphere, the spacecraft will be subject to both extreme heat in direct sunlight and deep cold in Earth’s shadow. How will the components expand and shrink? Will the temperature variation damage the spacecraft? To answer these questions, engineers put the instruments in an insulated vacuum chamber and test every variation in temperature without an atmosphere. This is essential to ensure that everything will work during and after launch. After each component is built, all of the pieces are shipped to Orbital Sciences Corporation in Gilbert, Arizona, to be assembled on the satellite frame. TIRS is shipped via truck to Arizona. Before the shipment, engineers placed a mass simulator on the truck and drove around the Washington, D.C. Beltway to test the stress the instrument would experience. They wanted to ensure that the packing material would keep the instrument safe. Assured that the packing material will work, they loaded TIRS onto the truck. The journey to Arizona was successful. 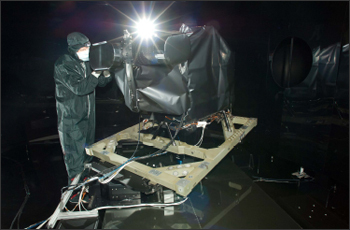 The Operational Land Imager was completed at Ball Aerospace in Boulder, Colorado, and shipped to Arizona to be added to the spacecraft. Both TIRS and OLI were integrated onto the Landsat Data Continuity Mission frame by early March 2012. The Landsat Data Continuity Mission is scheduled to launch from Vandenberg Air Force Base, California, in January 2013. An Atlas-V rocket will carry LDCM into space. 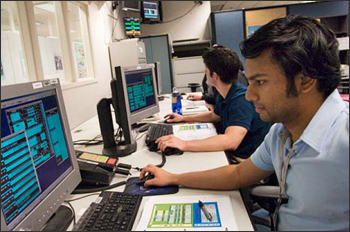 These engineers are monitoring NASA’s Aqua spacecraft during one such maneuver in the satellite’s mission control room at NASA Goddard Space Flight Center. Photos credit: William Hrybyk, NASA GSFC. After launch, the Landsat Data Continuity Mission will be renamed Landsat 8. The United States Geological Survey will control flight operations, data collection and data distribution. 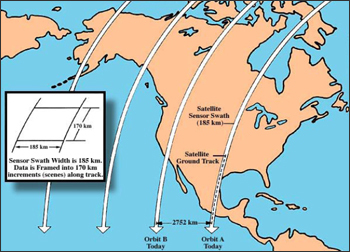 Landsat 8 will orbit from north to south during the day, crossing the equator at about 10 a.m. local time. It will fly 705 kilometers (438 miles) above the Earth. Engineers will monitor the satellite 24 hours a day, 7 days a week. They will move the satellite if debris threatens it or if it drifts out of its ideal orbit. The U.S. Geological Survey will operate Landsat 8, but the mission control center will be located at NASA Goddard Space Flight Center. Receiving stations operated by USGS will collect data from Landsat 8 and send it to the USGS Earth Resources Observation and Science (EROS) center in Sioux Falls, South Dakota where the data will be processed and distributed. All Landsat data are available at no cost. I manage the contracting company that builds the LDCM spacecraft for NASA, and I coordinate with the systems engineers and test engineers to make sure the Observatory works as it should before it gets launched. I get to work on something that I know will help people once it’s sending data to us on Earth. And everyone I work with really likes what they do, which makes it very easy to go to work every day! What education degree or credential do you have? 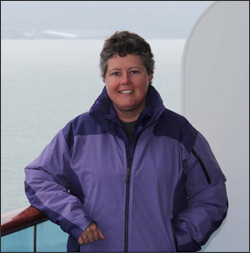 I have a Bachelor of Science degree in Aerospace Engineering and a Master’s degree in Applied Remote Sensing and Geoinformation Systems. What were your favorite courses during your academic career? My favorite undergraduate classes were in aerodynamics and flight structures. It still makes me feel good to know why I’m very safe in an airplane! I translate “science speak” for engineers and “engineering speak” for scientists, to help the two groups communicate with each other. In other words, I work to understand the measurements the scientist want or need to make, then use my knowledge of physics and engineering to translate that into requirements that engineers can understand and use to build the instrument. While the instrument is being designed and built, I translate engineering language about how the operation of built instrument will affect the science measurements, so the scientists will understand that. I love most applying a broad range of physics, science applications, and engineering disciplines to solve an important problem. LDCM is important! I have a Bachelors Degrees in Physics and Electrical Engineering and a Masters of Science in Electrical Engineering with an Electro-Physics emphasis. My favorites were Calculus, Dynamics, Semiconductor Physics, Lasers and Electro-Optics, and Electromagnetics. What is one thing you love to do aside from your professional work at NASA? I ride a single-track mountain bike! 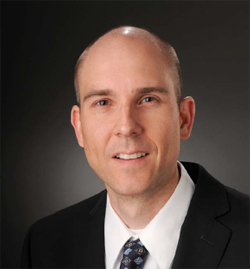 Frank Grochocki Principal Optical Engineer, Ball Aerospace & Technologies Corp. I am an optical engineer by training and perform a specialized type of optical analysis called stray light analysis. This type of analysis is responsible for minimizing the amount of unwanted optical radiation (light) that gets to a detector. The part of my work that I enjoy the most is the multidisciplinary and system level view of the instrument that is required. The type of analysis that I perform requires pulling together optical, mechanical, and detector details and knowledge into one mathematical model. I have a Bachelor of Science degree in Optical Engineering from the University of Arizona College of Optical Sciences. My favorite courses were the optoelectronic device physics courses, which covered lasers and detectors, among other topics. Courses on geometric optics and radiometry were very beneficial to my current type of work as well. Geometric optics covers the building blocks of optical engineering such as lens design and image forming calculations. Radiometry is the study of the measurement of optical radiation and its sources. It’s my job to make sure there’s no bug in the software that would cause the spacecraft to fall from the sky. We can fix small bugs on orbit and still get the science data, but I have to make sure that the spacecraft and instruments are safe during those times of fixing software, and that we can get that fix loaded. I love to touch things that go into space. Sometimes I get to work with the hardware, and it’s really cool to be in the same room with it! It’s even cooler to sit at a NASA console on launch day or even to be at the launch site, and to see years of work lifting into space. I have a Bachelor of Science degree in Physics with a minor in Mathematics. Of course my favorite courses were physics and math. But I loved practical physics like engineering physics, electronics labs, classical dynamics, and computer programming. What is one thing you love to do aside from your professional work? When I’m not at work, I’m either riding my horses, training my dogs for obedience, or hanging out with friends at the lake.